Home › Resources › Protect yourself from the sun! Bad news…. One in five of us will get skin cancer due to sun exposure. That is more than all cancers combined. We live and run in South Carolina, the sun is shining over 89% of our 365 days. Good news…. you can reduce the risk by 80% simply by regularly using approved sun care products. 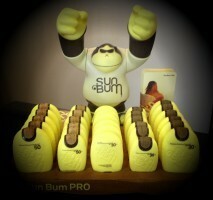 So, the next time you are out in the sun or on your run, protect your laziness and slather on some Sun Bun. Sun Bum sunscreens are tested, approved and recommended by the Skin Care Foundation (SCF). The SCF is internationally recognized as the educational leader to the public and medical communities related to skin cancer prevention. The SCF does not approve or lend its seal of approval to higher risk products that do not meet their stringent standards.